This astonishing image clearly illustrates why astronomical observatories are usually built in remote, and often inhospitable, places. 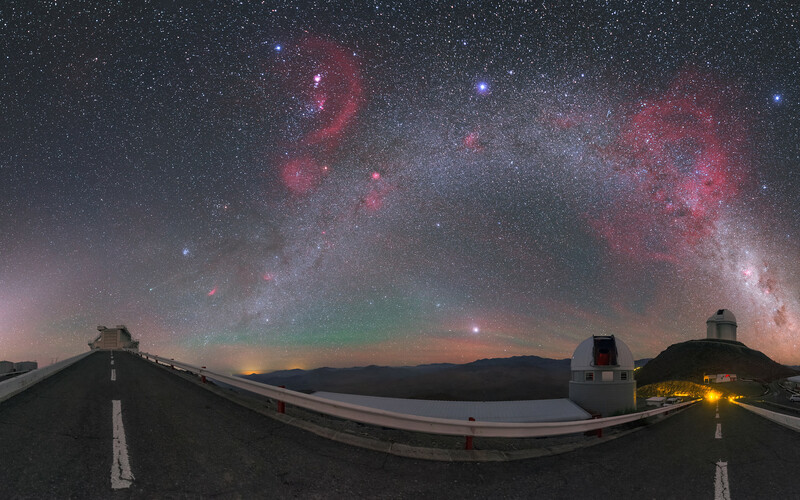 At ESO’s La Silla Observatory in Chile, the sky is so clear and untroubled by man-made sources of light that it appears as if a brightly-coloured celestial firework display is in progress! 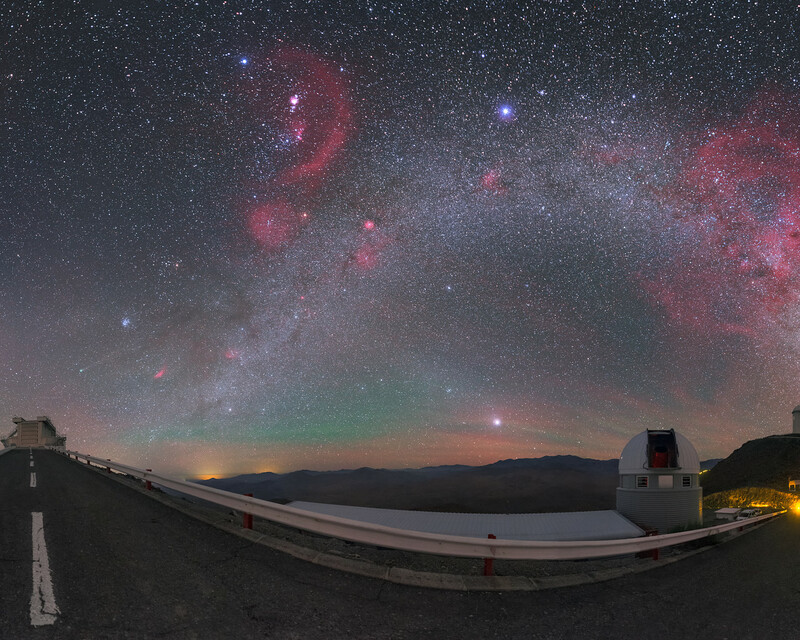 This photograph, taken by ESO Photo Ambassador Petr Horálek, has been digitally projected to show as much of the sky as possible. 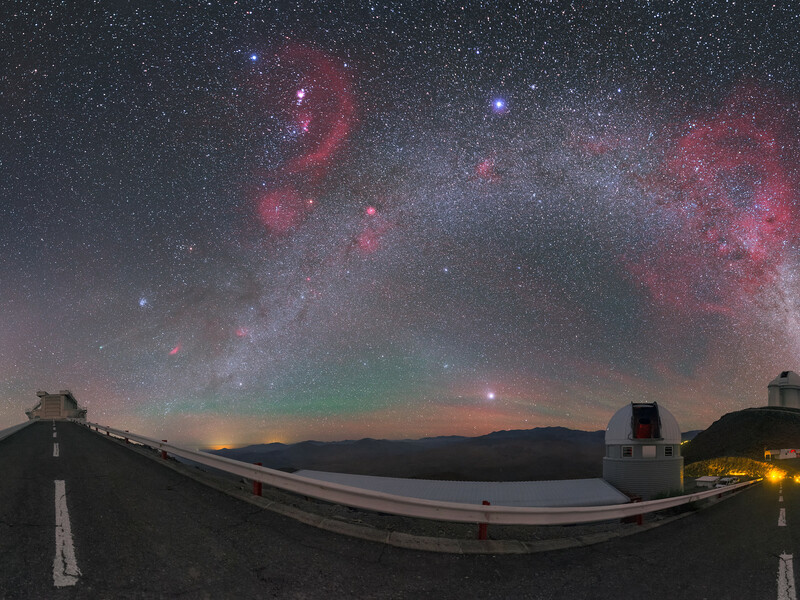 This is why the roads leading to ESO’s 3.58-metre New Technology Telescope (left) and 3.6-metre telescope (right) appear distorted, and the bright river of light that is the Milky Way seems to curve across the sky, stretching from horizon to horizon. Cosmic fireworks aside, this scene is filled with awe-inspiring phenomena. The pink “fireworks” themselves are actually large accumulations of glowing gas known as nebulae. To the right of the Milky Way lie the Magellanic Clouds, two nearby dwarf galaxies. Rising up from the horizon on the left of the image is a pale, white-ish column of light. This is the glow of Zodiacal light, caused by sunlight scattering off dust particles in the Solar System. At the centre of the image is another glowing region — green this time. This is airglow, a phenomenon that occurs high up in the Earth’s atmosphere, where a variety of processes create ghostly coloured light.